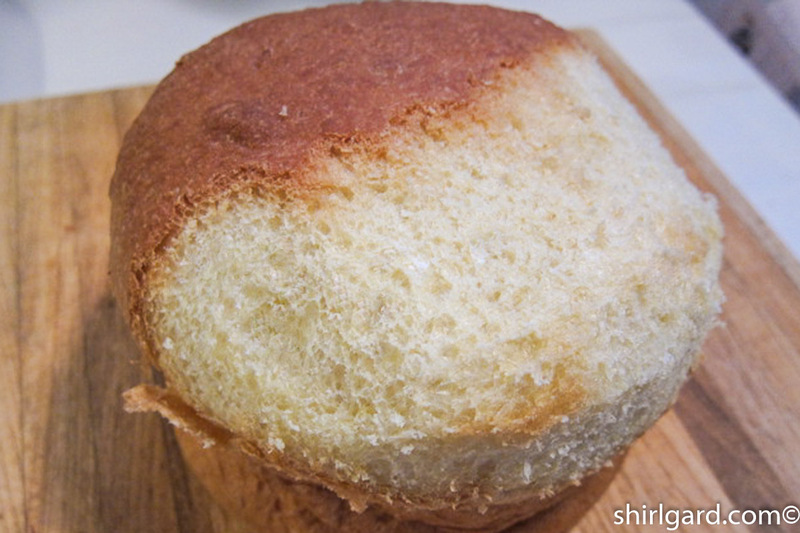 Ok, so far I’ve made five batches of Sally Lunn Buns (2.01.16 Post) trying to get the recipe just right. I wanted the flavor to grab you, I wanted the texture to be just right, and I wanted it to be baked as perfectly as possible. Having done all that to the best of my ability, I’ve hopefully created a memorable recipe. But now, I have a situation. 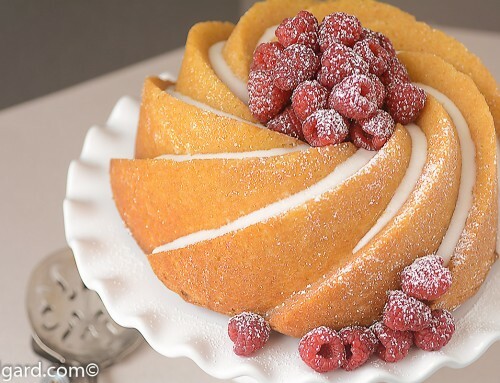 There is some (actually, a lot of) extra Sally Lunn in my freezer, much of it in the “less than perfect” category, just waiting for me to find something to do with it. 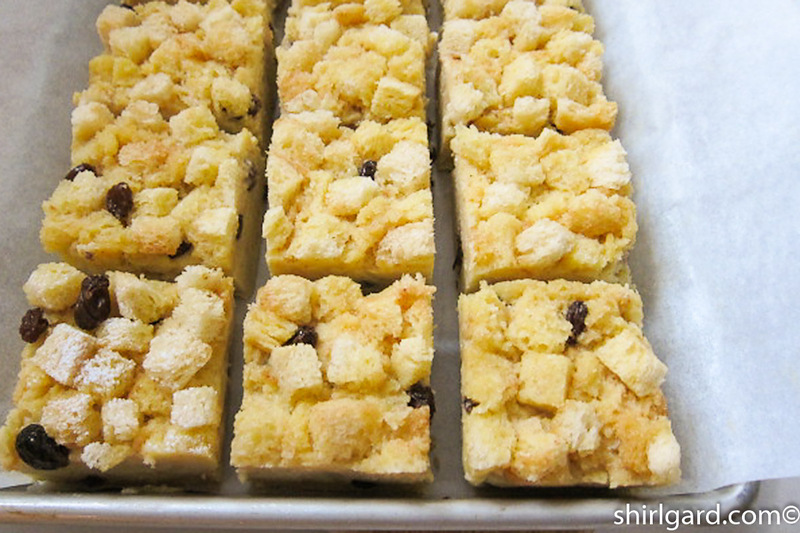 In my mind, the best possible use for this stash is to make bread pudding: Sally Lunn Bread Pudding. 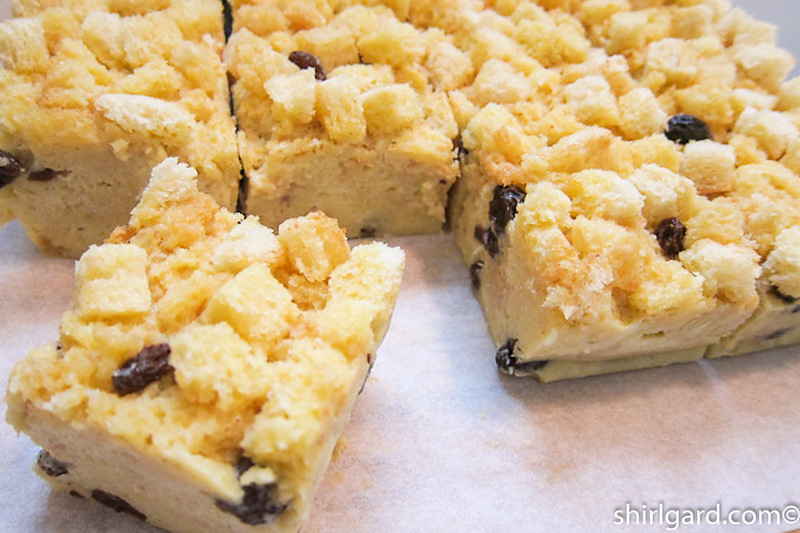 For how this bread pudding should look and taste, I am “reaching into my memory pool”: deep into the pool. Two careers ago, when I was a buyer for a large department store in Houston, I traveled to New York once a month on buying trips. With a nice expense account, I always ate well. One of my favorite places to go was Lavin’s, which was near our offices in the Garment District at 40th and Broadway. If you walked around the corner from the office on a cold wintry night and headed east on West 39th Street, you would see the warm light coming from the front windows before you got to 6th Avenue. It was (I don’t think it exists anymore) a haven for me for comfort food. I found a New York Times restaurant review by Bryan Miller from June 20, 1986 where he refers to Lavin’s “uniformly excellent desserts: chunky bread pudding moistened with a heady bourbon sauce……” This review pretty well confirms my memory. 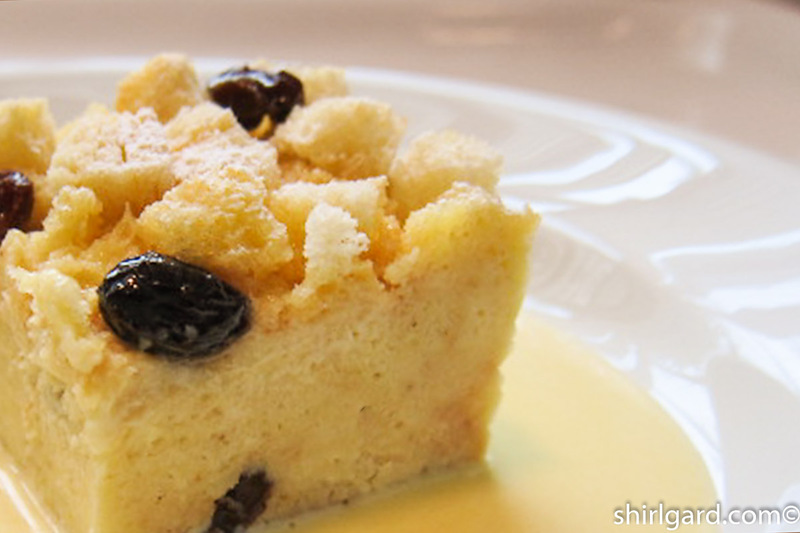 I had Bread Pudding at Lavin’s on almost every trip to New York. It was memorable and I craved it; I could never forget it. Even back in Houston, I would look forward to the next time. So here’s how it would go. 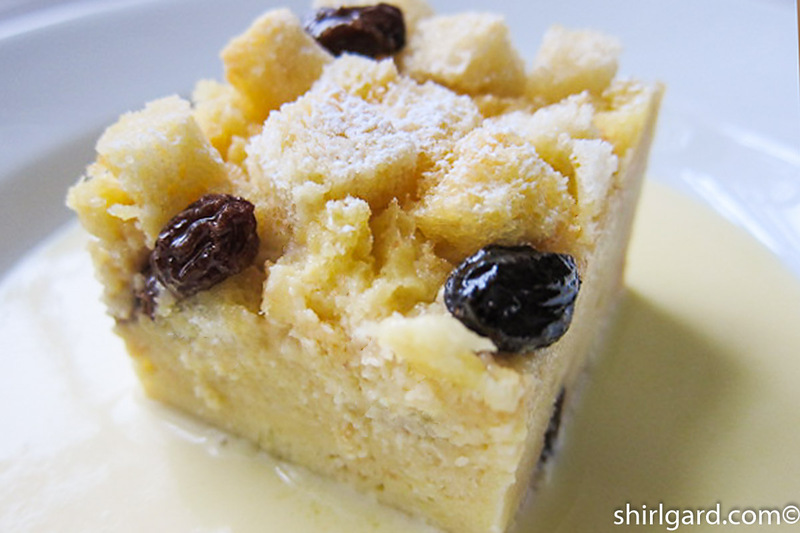 The waiter would bring a large shallow bowl with a generously thick square of warm bread pudding (warm is key) resting in a puddle of creamy, custard-y, booze-y sauce. 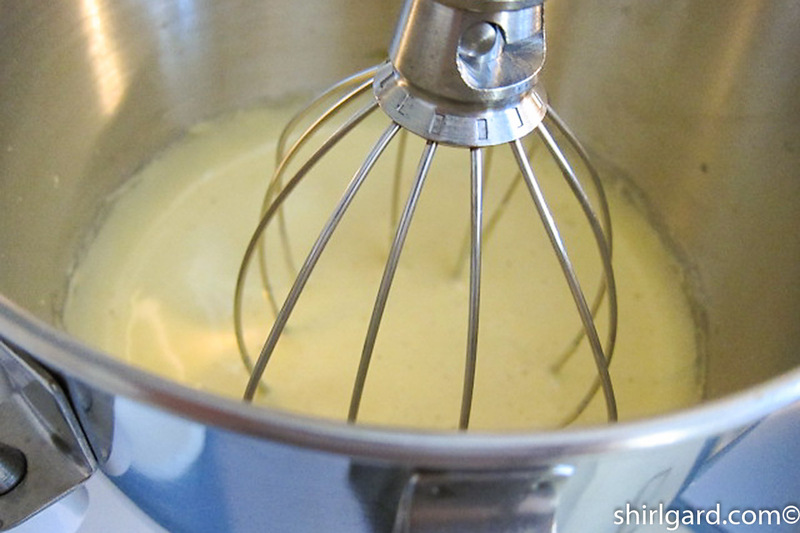 (See my recipe for Booze-y Bourbon Custard Sauce). Some of the sauce would have been spooned on top and allowed to trickle down the sides into the puddle. 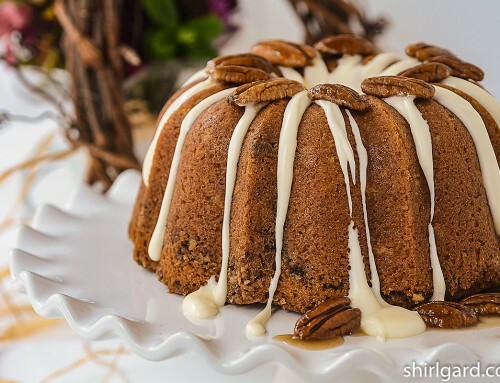 When I took a bite, I always wanted to make sure that I got some of the sauce along with the pudding, which included as a bonus, large plump dark raisins. Yum! Yum! Yum! I can taste it now. 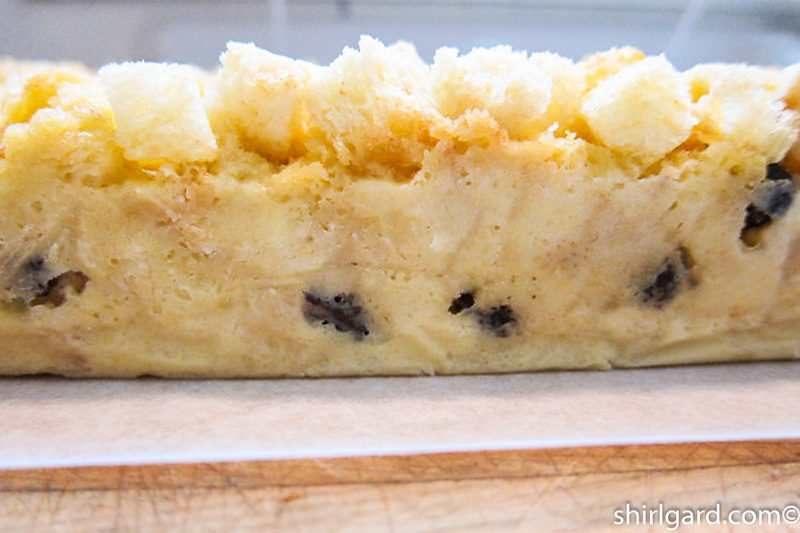 This is the image I had in my mind when I created Sally Lunn Bread Pudding. 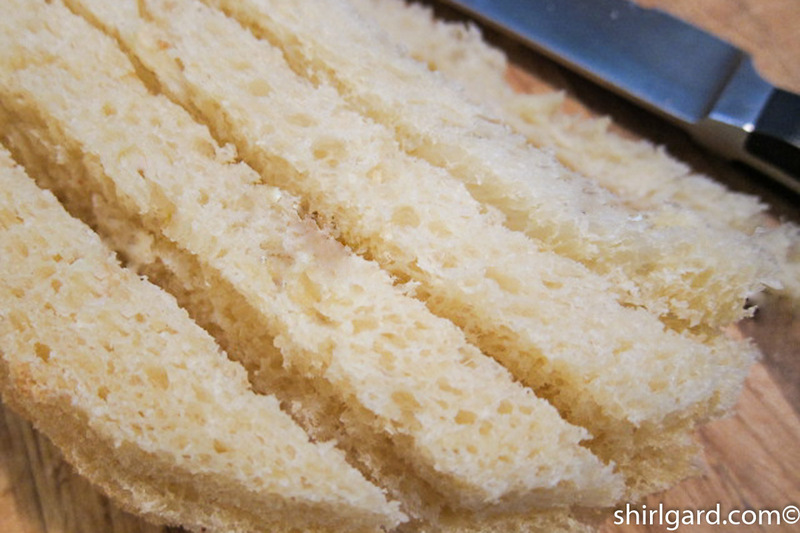 Sally Lunn Bunn: Peeling off the top & bottom crusts. 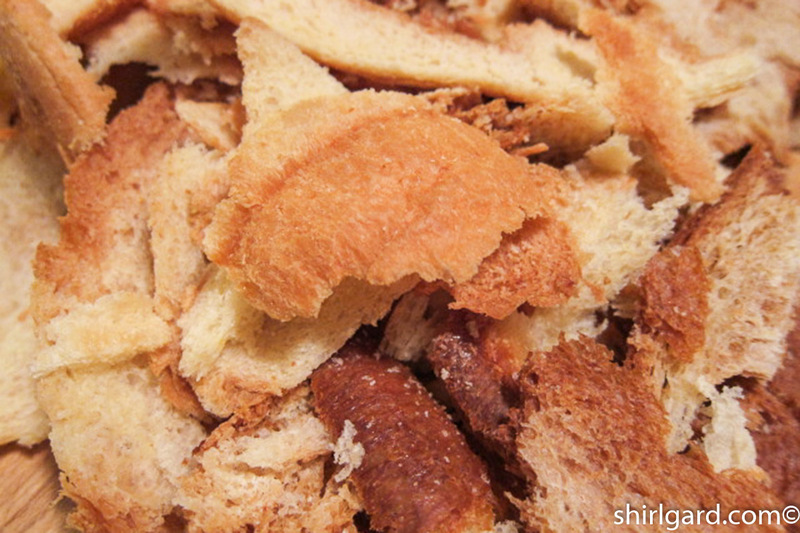 Make bread crumbs with the scraps. 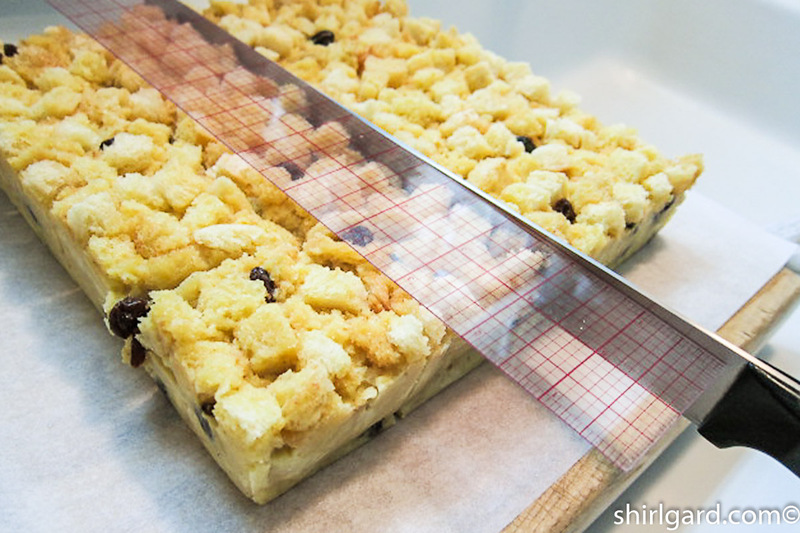 Cut the slices into 1/2″ strips. Cut the strips crosswise into 1/2″ cubes. 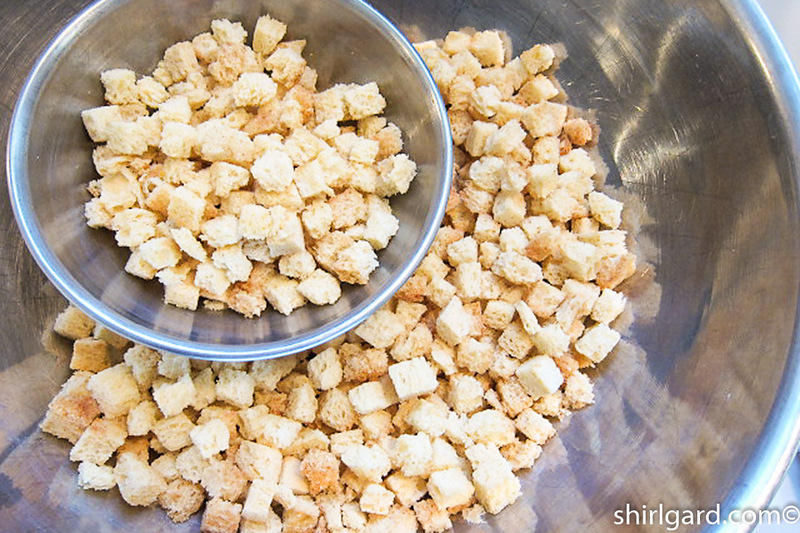 Lightly toast the bread cubes. Shape foil over upside-down pan. Fit the foil into the pan. Whipping the eggs and sugar to make the custard. When finished whipping, add the hot liquid. Strain through a chinois or fine mesh strainer. This removes some of the air bubbles. 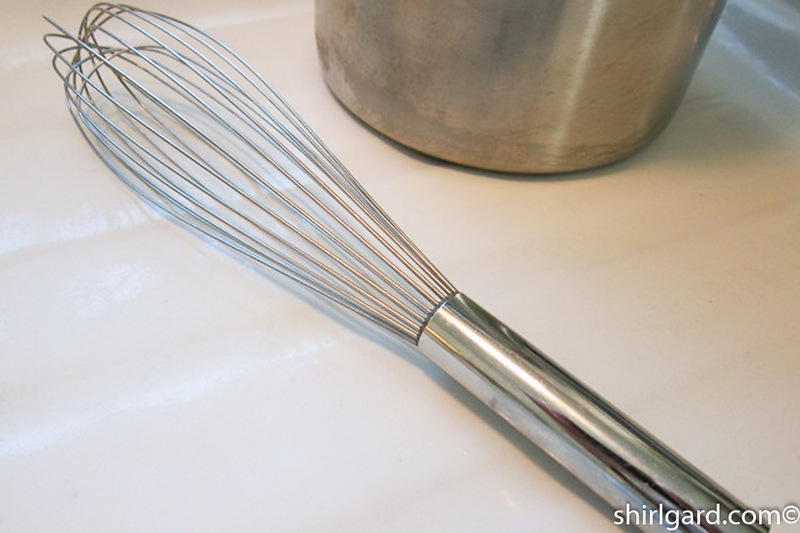 I like this shape whisk. 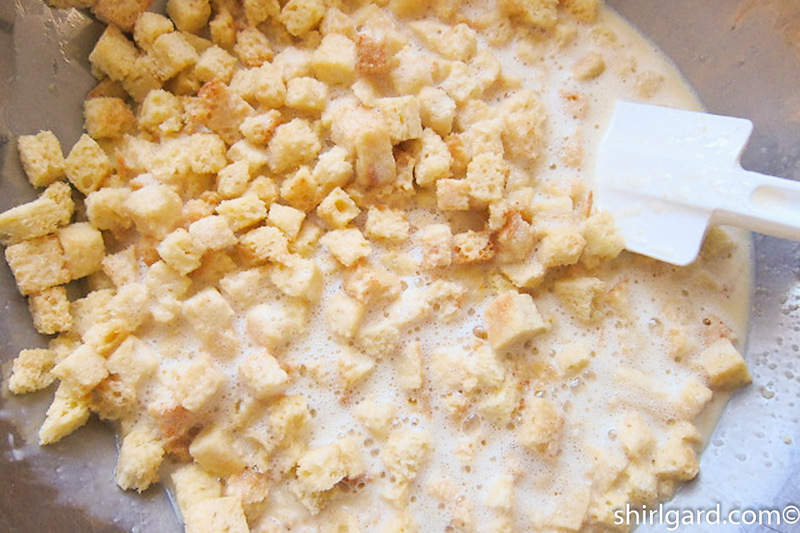 After cooling, add the custard to the bowl of toasted bread cubes. Spread in pan. 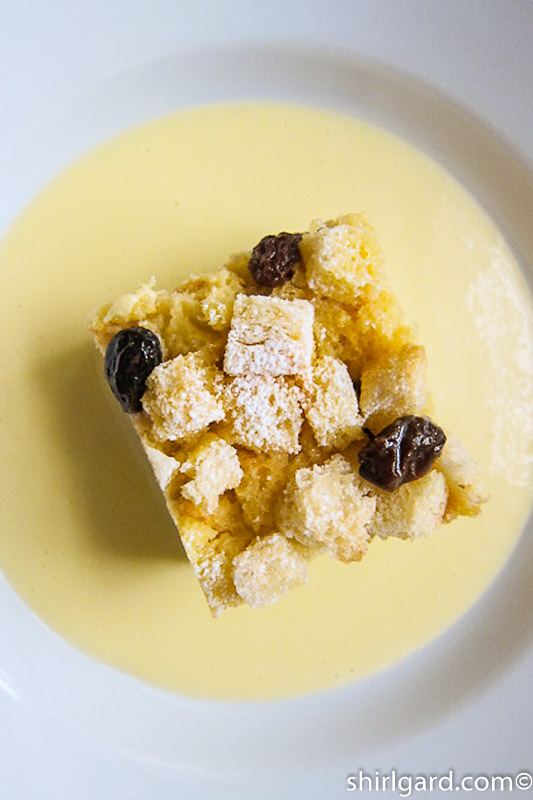 Scatter reserved toasted bread cubes over the pudding and drizzle with reserved custard. 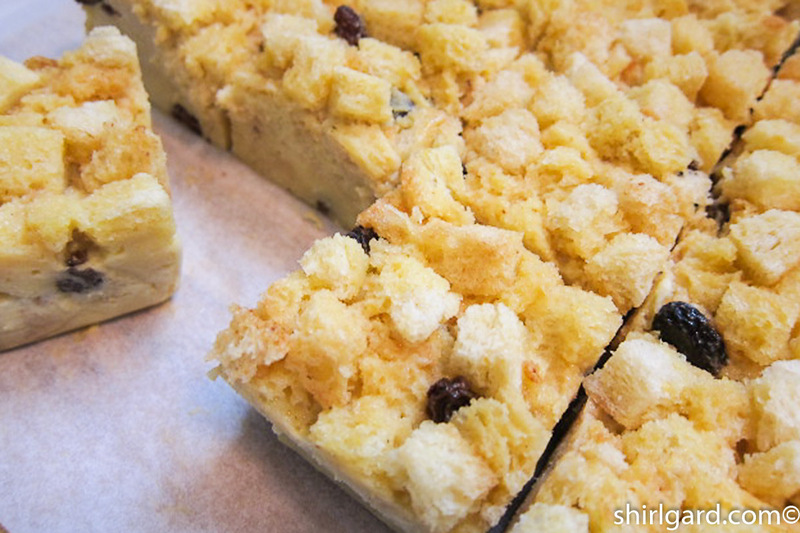 Baked bread pudding. Freeze overnight. Lift out of pan and peel back the foil. 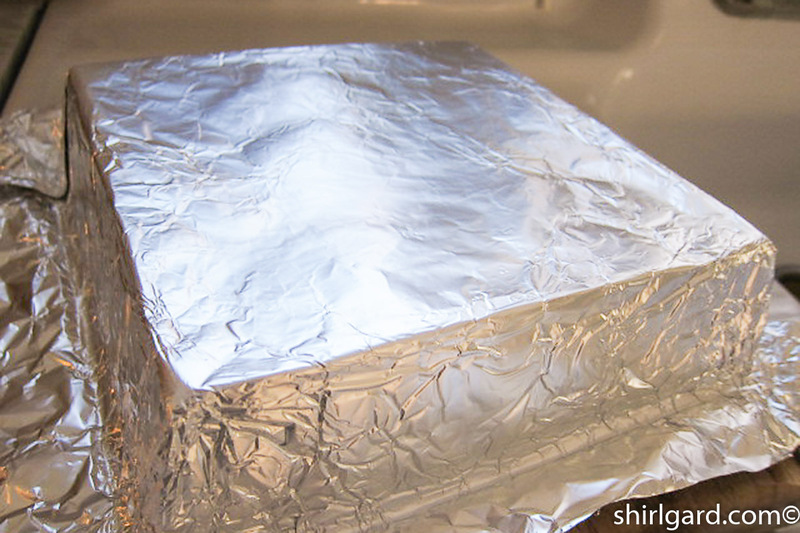 Replace foil with parchment paper. Use a ruler (I like a 2″ C-Thru ruler) to cut lengthwise 2″ strips. 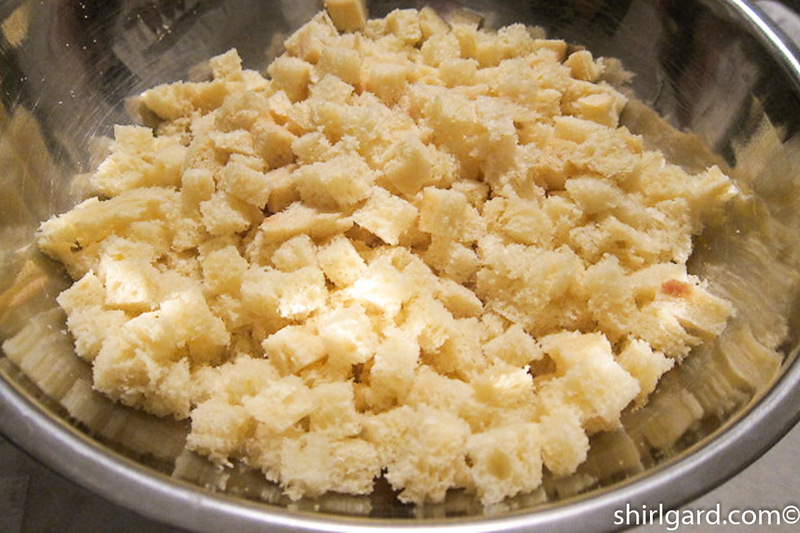 Then cut crosswise into 2″ squares. 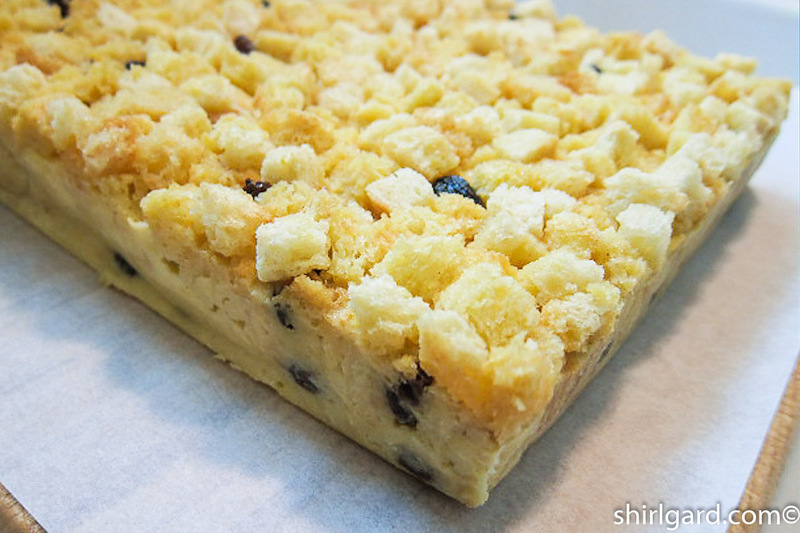 Arrange the cut squares on a quarter-sheet pan. Ready to serve. Warm before serving. Two wildly different factors inspired me to create this recipe. Number one, I had a lot of baked Sally Lunn on hand in my freezer, from doing my post on The Legend of Sally Lunn: Sally Lunn Buns (2.01.16). Sally Lunn is a light and airy bread, similar to brioche, which makes a good bread pudding because, like brioche, it absorbs custard so well. The other factor involved a long ago food memory of the best bread pudding I ever ate, one that I used to have in the 1980's at a Manhattan restaurant called Lavin's. It was located in the garment center where I used to spend a lot of time when on buying trips (another career in another time) to New York. 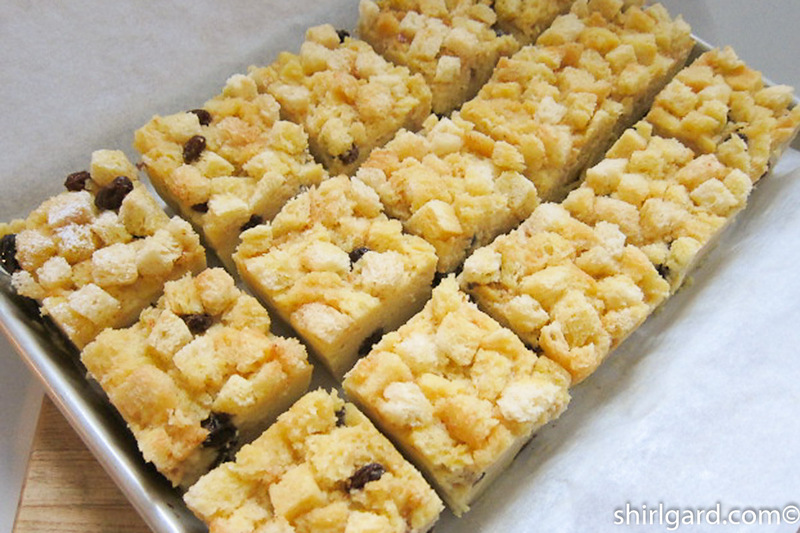 The result is Sally Lunn Bread Pudding. 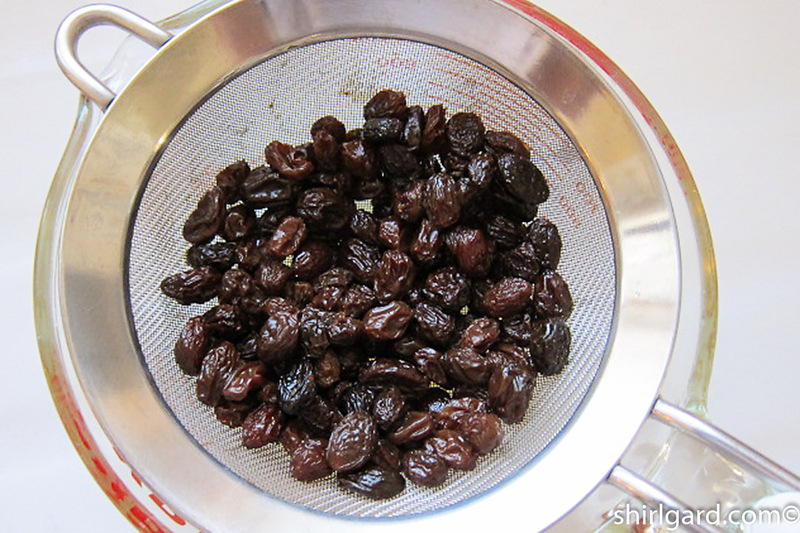 - Soak in a mixture of 80g water (1/3 cup) and 1 Tablespoon sugar: Bring to a boil, add raisins and remove from heat; cover and let cool. Drain off excess liquid. PREP 9" x 9" x 2" (23 cm x 23 cm x 5 cm) SQUARE PAN: Line the pan with heavy-duty foil by first tightly pressing a sheet of foil around upside-down pan. 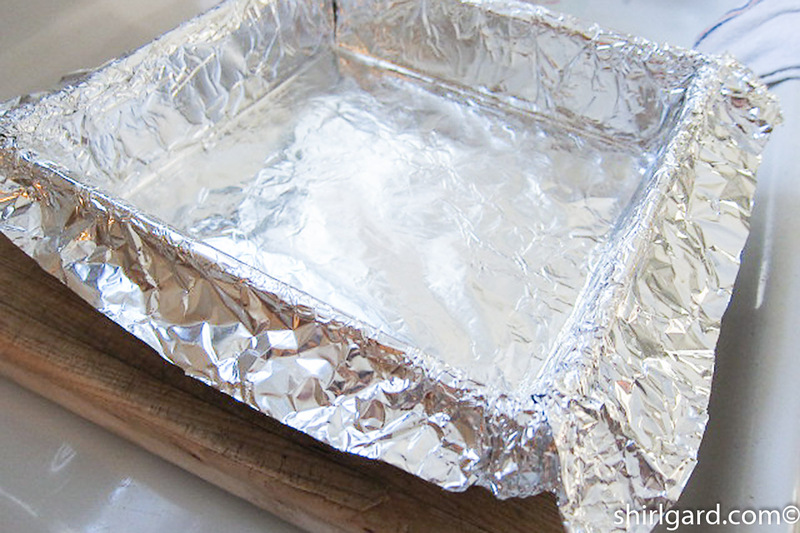 Then turn the pan right-side up and fit the foil inside, being careful not to puncture the foil. Trim the edges so that there is a 2-inch overhanging border all the way around. Spray the foil lining with Pam (with flour) or Baker's Joy. 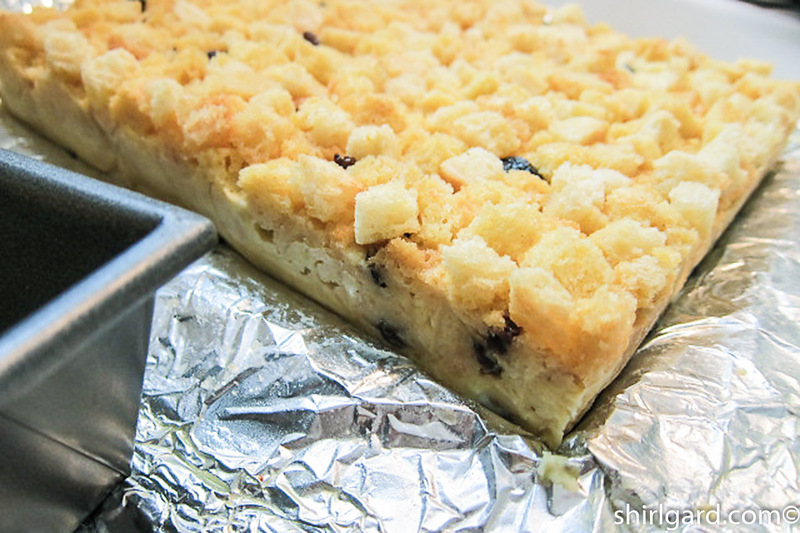 Lining the pan with foil allows you to lift the whole pudding out of the pan after being frozen so that it an be cut neatly into 2" squares. PRE-HEAT oven to 275° F (135° C). 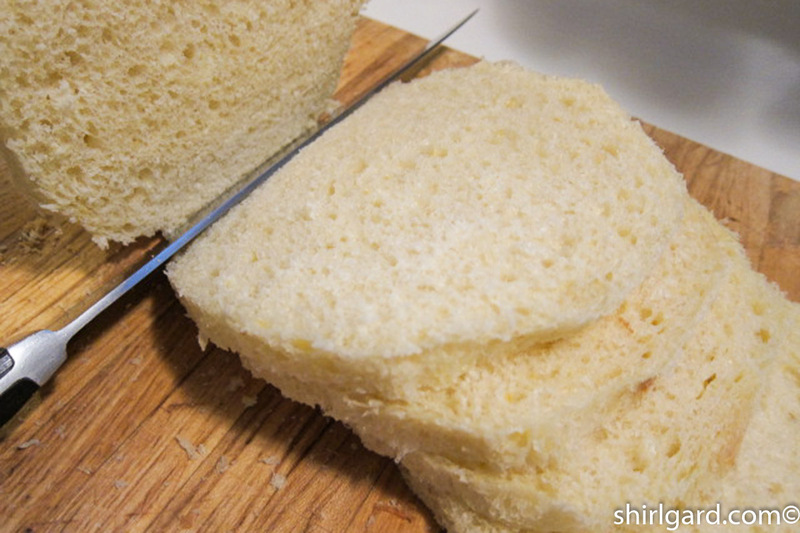 PREP SALLY LUNN BUNS: 1) Remove crusts from tops and bottoms of the loaves, leaving the side crusts intact. 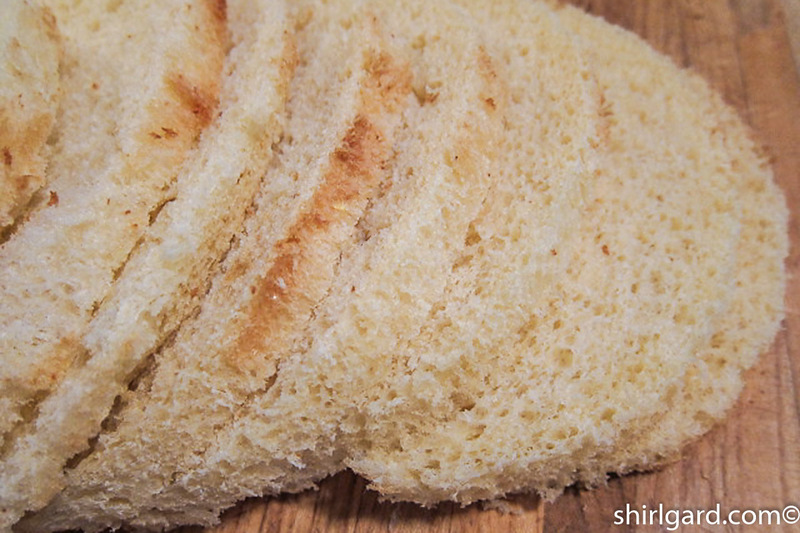 Slice the loaves into ½" slices. 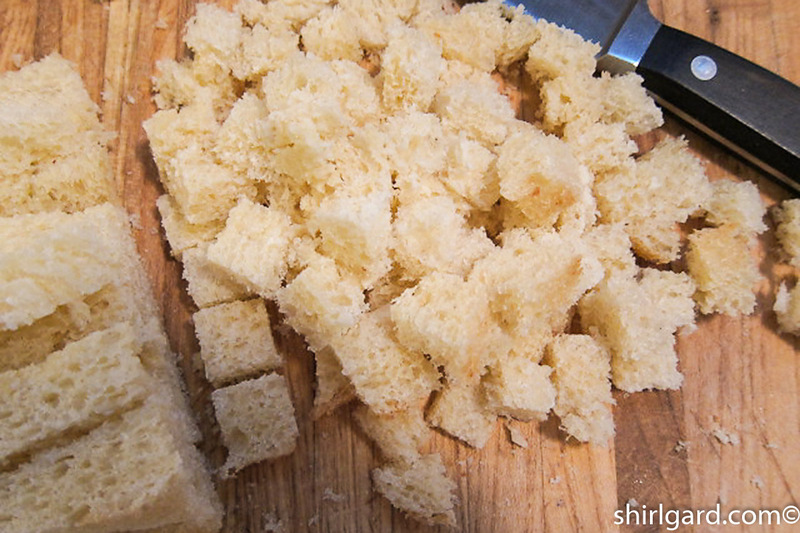 then cut the slices crosswise into ½" cubes. Spread the bread cubes in one layer on half-sheet pans and bake @ 325° F (165° C) for 12 - 14 minutes, until the cubes are dry and lightly toasted. Let cool on sheet pans. 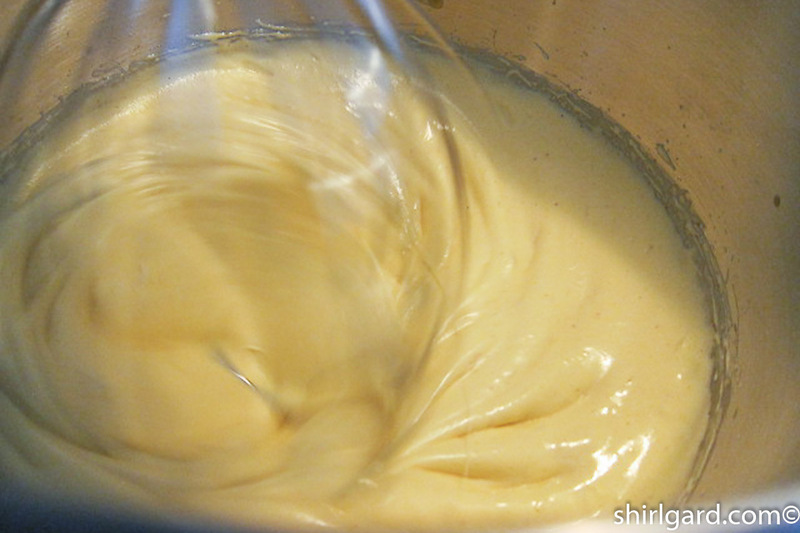 MAKE CUSTARD: 1) Heat cream, milk, sugar (100g), vanilla, nutmeg, and salt to a simmer, whisking often to prevent scorching, in a small Dutch oven or large heavy saucepan. 2) In Kitchen Aid, whip the egg yolks and whole eggs with the sugar (75g) on high speed just until lightened in color and thickened slightly, about 2 minutes. 3) Pour the hot liquid into the beating yolks in a slow steady stream. 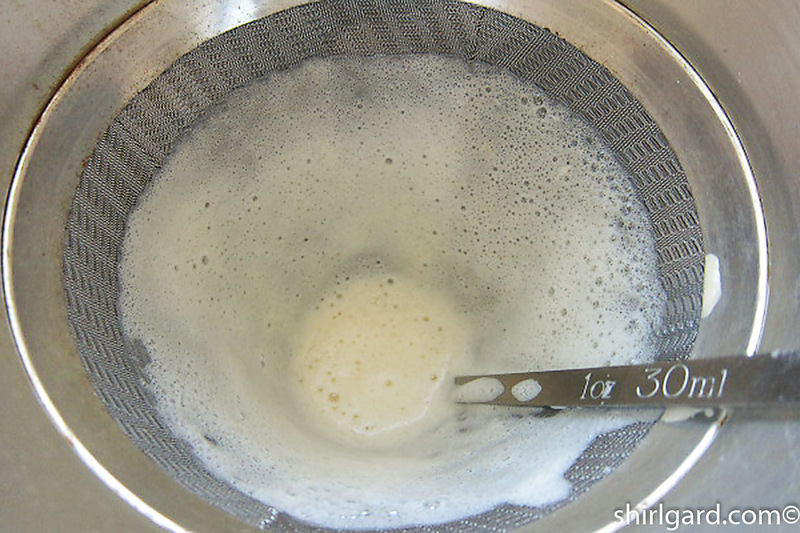 4) Strain the custard through a chinois into a bain marie, or strain through a fine mesh strainer into a bowl. DO NOT COOK THE CUSTARD. 5) Cool custard at room temperature just until it no longer feels hot to the touch. 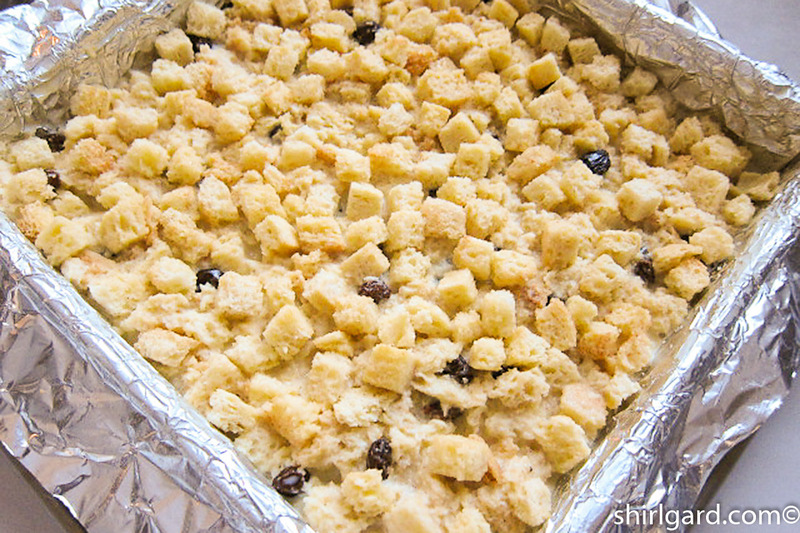 TO FINISH AND ASSEMBLE PUDDING: 1) While custard is cooling, transfer toasted bread cubes to a large stainless steel bowl. 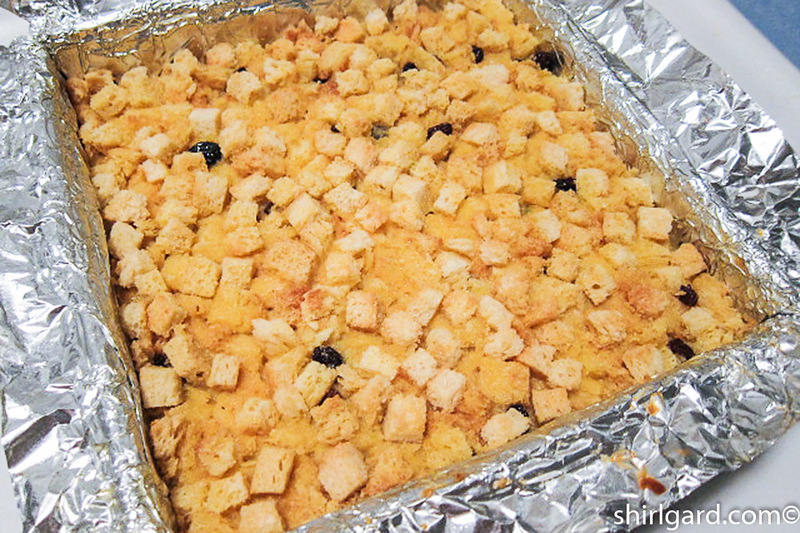 Take out 1½ cups (60g) of the cubes and set aside for garnishing the tops of the puddings. 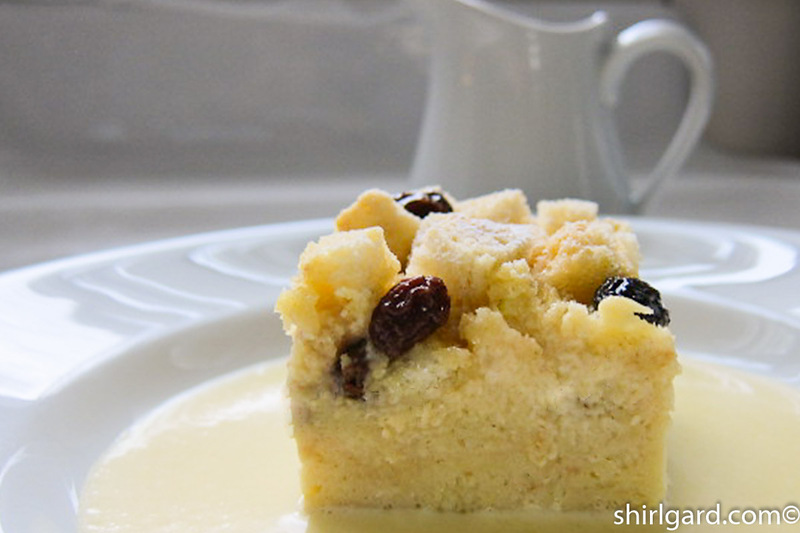 2) Remove 1 cup (250g) of the warm custard and set aside to drizzle over the top of pudding. 3) Pour remainder of custard over the toasted bread cubes in the bowl; stir and let soak 20 M. 4) Stir in the plumped and drained raisins. 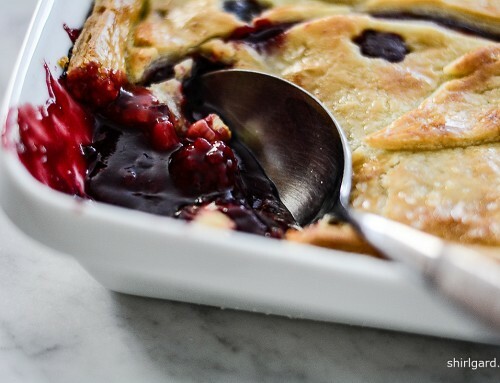 5) Transfer the pudding to the prepared pan and smooth with an offset spatula. 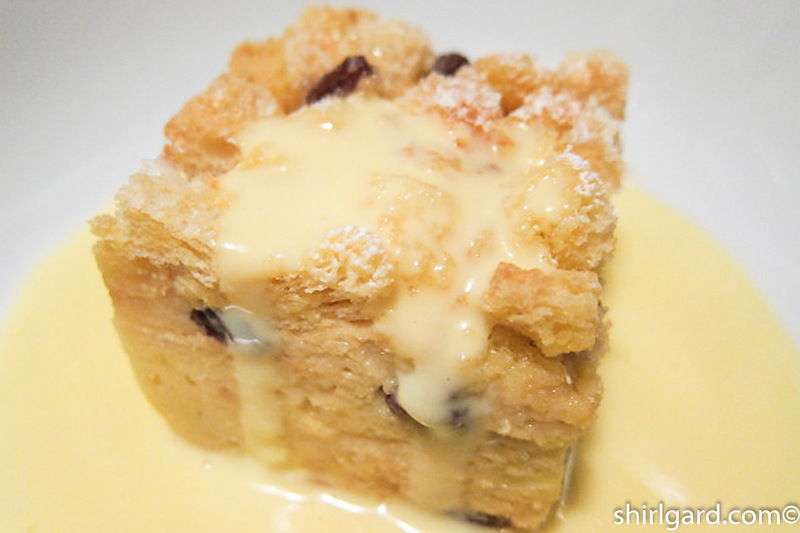 6) Scatter the reserved toasted bread cubes over the top of the pudding and press in; drizzle with the reserved custard. BAKE @ 275° F (135° C) until set and the top is golden brown, about 45 minutes. Test doneness by pressing the top of the puddings. When done, no liquid will ooze out when pressed, and the internal temperature should be 170° F (76° C). 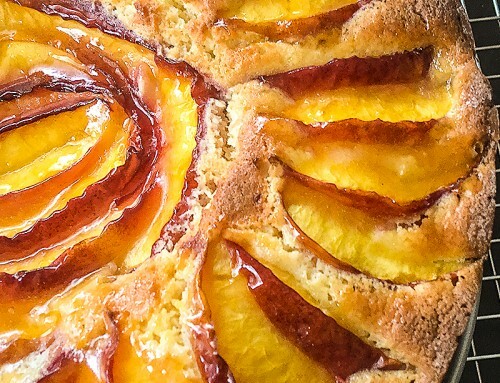 Watch closely: Do not over-bake. 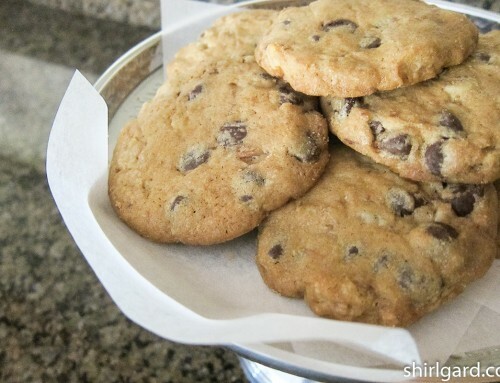 Recipe developed by Shirl Gard. 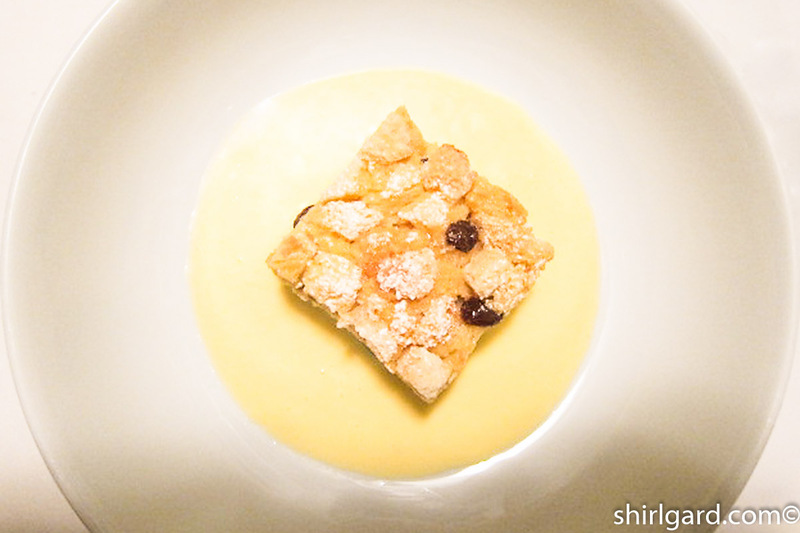 As a starting point, I used a Crème Anglaise recipe for the bread pudding custard that was given to me by Gilles Lavergne, who I worked with at Wheatleigh when I was just beginning my pastry chef career.